Nonetheless iTunes can be deleted from the Mac, but without a very good reason it should not be done. iTunes is integral to supporting other Apple features and hardware, ranging from the App Store to the iTunes Store, and without iTunes installed you won’t be able to sync apps, music, books, movies, and anything else with an iPad, iPod, iPhone, or Apple TV. Assuming you understand that and you still want to remove iTunes from your Mac, this tutorial will show you how to delete iTunes from the computer. 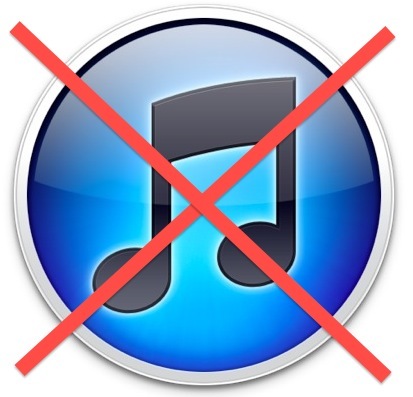 Virtually nobody should delete iTunes from a computer, it is integral to the functioning of Mac OS and the media system and interacting with iOS devices. Typically the only reason someone would delete iTunes on a Mac is to either downgrade to a prior version of iTunes software (by then installing the older version after removing the recent one), or if you are setting up a locked down workstation and want to remove iTunes for that reason. I Accidentally Deleted iTunes, Help! If you find yourself somehow accidentally deleting iTunes, don’t fret too much because it’s always easy to reinstall. You can download the newest version directly from Apple, and running their installer will bring iTunes back to life on your computer. I can see this needed for public computers and schools, but considering there is no real iTunes alternative out there, uninstalling the application is a bad idea. Go to OldApps.com and click on Mac. Find iTunes and download an older version. There are loads of options for music playback: VOX, COG, VLC (does a lot more than just music), and some UNIX ports, but iTunes, thanks to Apple’s obsession with putting everything into one app, is the only way to make your iDevice sing with your computers. The iTunes Terms & Conditions have changed. i deleted itunes but it keeps coming up with the above on update is there a way to stop it. I’ve tried. but I can’t enter the password. could u help me out? anyone know why? I need help please…. The password doesn’t show as you type. Just type even though it seems like it’s not working. Then press enter. It will work. Had to resort to unistalling because iTunes kept randomly opening by itself and I couldn’t find the reason for it. This is why I want to delete it. But I need App Store. The reasons to uninstall iTunes are plentiful. 1. It’s a cumbersome program but is the default to play all types of audio for god knows what reason. 2. For those who don’t own an iPod or use a service like spotify to sync their music, having itunes makes things a little annoying. 3. It’s essentially apple bloatware. It has its uses but theres just as little reason to keep as any other app that does you know good. Bonus: Who cares? the library stays and your purchases are linked to your account. You can bring it back with the snap of your fingers. The iTunes app or iOS version needs to be updated. Major pain, Apple needs to stop forcing those updates. I’d be super areful with this advice. I followed it to the letter, and iTunes will now not work. Says I am missing a DLL. Reinstalling iTunes doesn’t help. So now my iPhone doesn’t work and my Macbook’s iTunes doesn’t work. Double fail. There are plenty of reasons to delete itunes. It’s a bloated app that just takes up space and is useless if you don’t use an iphone. Love my mac, don’t need the iphone accessories. I tried this Terminal action, but it did not delete iTunes, just said that ‘Operation not permitted’ for each and every line of thing it tried to delete/remove. In the Get Info box, under the ‘Sharing & Permissions’ section, it shows four names: ‘everyone’ (Custom privilege), ‘system’ (Read & Write privilege), ‘wheel’ , and then another ‘everyone’ (the last two having Read Only privileges), and unable to change any of the privileges, saying that I do not have the necessary permission to do so. I am wanting to go back to previous version of iTunes, because latest version “fixed” a “problem” that was in iTunes since the beginning, and they just got around to fix… and it ended breaking something that was never broken with me since the beginning. Apple Support guy, told me there was no fix, unless I reverted back to the last previous version, before the “fix”, and directed me to the previous versions downloads page. Yet, I can’t install the previous version, because it says I already have a newer version, and can’t delete the latest version. Thanks a bunch! I have saved the command and will find a way to automate this each boot, problem solved! Virtually, there is no reason to keep this enormous piece of excrement installed, In my 53 years, while working on all types of OS systems from Linux, OSx, to Windows, I have never seen such an obtrusive program as iTunes. If you make even a small mistake and click yes, it will also destroy your MP3 collection. Good thing I make back-ups. IT WORKED. Thank you so much!! My iTunes didn’t recognize my iPhone and I tried everything, and this solution worked. Super easy, great advice! I have tried this but it has not worked. I am trying to delete iTunes on my laptop because it is not detecting my iPod.